A gimbal is a photographic accessory that comes in two flavors: one is a motorized device designed for video that helps to keep a camera steady while it’s being moved around, while the second is a tripod head that enables photographers to shoot with long telephoto lenses on a tripod while offering maximum movement for tracking moving subjects such as wildlife. Motorized gimbals for video offer stabilization over three axes, which means nearly all movement of the camera can be counteracted to keep video footage fluid and smooth. Shooting with a gimbal gives you the freedom of traditional handheld shooting, but the footage captured is completely smooth and cinematic in appearance. Without a gimbal, handheld video footage can look shaky – such footage is a shooting style in its own right because of the raw, 'documentary' look it creates. Once the preserve of professional filmmakers, in recent years motorized gimbals have dramatically dropped in price, making them much more affordable for enthusiasts. Gimbals for mobile phones, action cameras and compact cameras can be bought for not much more than £100/$100, although you'll need to spend more to get the best quality; professional models aimed at larger cameras can cost upwards of $1,000/£1,000. 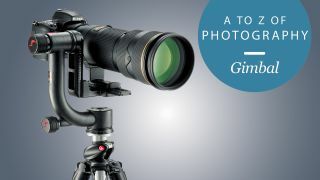 The other type of photography gimbal is a special type of tripod head that’s designed for photographers using heavy lenses with long focal lengths. These heads aren’t motorized like video gimbals, but instead enable you to smoothly rotate your lens around its center of gravity and tilt it up and down with ease, all while keeping it steady. This makes a gimbal head ideal for wildlife and airshow photographers who need both stability and the ability to track moving subjects. These heads are heavier and much more bulky than ball heads or three-way heads, and wouldn’t be ideal for landscape or architecture photography for instance.